Guess what this is. 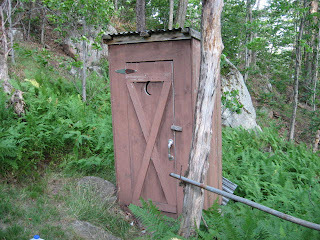 Yep, the outhouse at camp. Camp is back of beyond between Canton & Potsdam. We drive in 3 miles on a one lane road, no water, no electric. We have LP gas for cooking & lights in kitchen & over table. We carry in water and take baths in the lake. Camp is our special place. So peaceful.